A black hole is a large amount of matter packed into a small area, creating a strong gravitational field that allows nothing, not even light, to escape. Astronomers describe quasars as the most luminous beacons in the sky. Using data from the 2.4-meter Lijiang Telescope (LJT) in Yunnan, China; the 6.5-meter Multiple Mirror Telescope (MMT) and the 8.4-meter Large Binocular Telescope (LBT) in Arizona, USA; the 6.5-meter Magellan Telescope at Las Campanas Observatory, Chile; and the 8.2-meter Gemini North Telescope on Mauna Kea, Hawaii, USA, an international team led by Prof. Xue-Bing Wu at Peking University discovered a new quasar, with its central black hole mass of 12 billion solar masses and the luminosity of 420 trillion solar luminosities, at a distance of 12.8 billion light-years from Earth. This is the brightest quasar ever discovered in the early universe, powered by the most massive black hole yet known at that time. 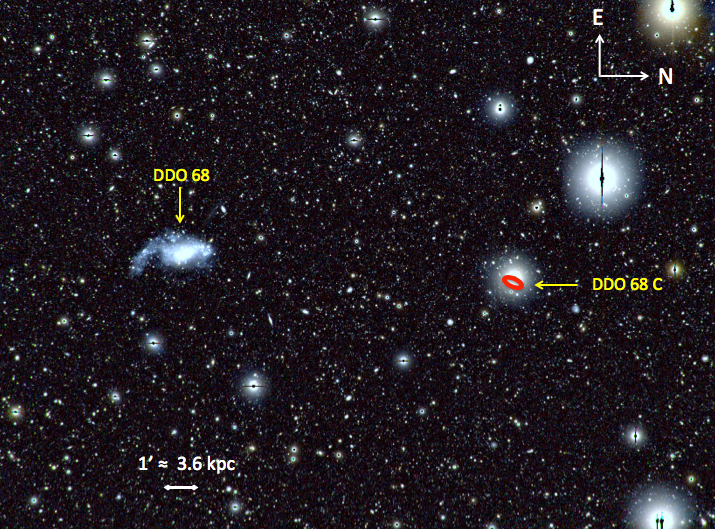 The discovery of this quasar, named SDSS J0100+2802, marks an important step in understanding how quasars, the most powerful objects in the universe, have evolved from the earliest epoch, only nine hundred million years after the Big Bang, close to the end of an important cosmic event that astronomers referred to as the “epoch of reionization”: the cosmic dawn when light from the earliest generations of galaxies and quasars were thought to transform the universe, ending the “cosmic dark ages.” This discovery is also a surprise: how can a quasar so luminous, and a black hole so massive, form so early in the history of the universe, at an era soon after the earliest stars and galaxies have just emerged? Discovered in 1963, quasars are the most powerful objects beyond our Milky Way Galaxy. It shines itself as its central supermassive black hole actively accretes surrounding materials. Thanks to the powerful new generation of digital sky surveys, astronomers have discovered more than 200,000 quasars, with ages ranging from 0.7 billion years after the Big Bang to today, with corresponding redshifts up to 7.085. Due to the expansion of the universe, objects are moving away from us. Wavelength of light received by us is larger than that of the originally emitted light. Redshift is defined as the ratio of the wavelength difference to the original wavelength. High redshift traces structure and evolution of the early universe. However, despite their high luminosity, quasars still appear faint due to their large distance away from us, and they are extremely rare on the sky, which make them very difficult to find. Among all the discovered 200,000 quasars, only 40 are 12.7 billion light-years away with redshift higher than 6. In recent years, a team led by Xue-Bing Wu, a professor in the Department of Astronomy, School of Physics, at Peking University and the associate director of the Kavli Institute of Astronomy and Astrophysics, have developed a method to effectively select quasars with redshift higher than 5 based on optical and near-infrared photometric data, in particular, using data from the Sloan Digital Sky Survey and NASA’s Wide-Field Infrared Explorer (WISE) satellite. Then, with spectroscopic observations, they have systematically discovered a large number of new high-redshift quasars. SDSS J0100+2802 is one among them but has the highest redshift in their sample, and is one of the most distant quasars discovered. The first optical spectrum obtained on Dec. 29, 2013, by the 2.4-m LJT shows that it is likely a quasar with redshift higher than 6.2. Active international collaborations allowed this team to further gather data from the MMT, the LBT, the Magellan Telescope and the Gemini Telescope. By carefully analyzing these data, the team confirmed SDSS J0100+2802 as a quasar with redshift of 6.3 and estimated its intrinsic properties. At 420 trillion solar luminosities, this new quasar is 7 times brighter than the most distant quasar known (which is 13 billion light-years away). It harbours a black hole with mass of 12 billion solar masses, proving it to be the most luminous quasar with the most massive black hole among all the known high-redshift quasars. By comparison, our own Milky Way Galaxy has a black hole with a mass of only 3 million solar masses at its center; the black hole that powers this new quasar is four thousand times heavier. “This quasar is very unique. We are so excited, when we found that there is such a luminous and massive quasar only 0.9 billion years after the Big Bang. Just like the brightest lighthouse in the distant universe, its glowing light will help us to probe more about the early universe,” said Xue-Bing Wu. 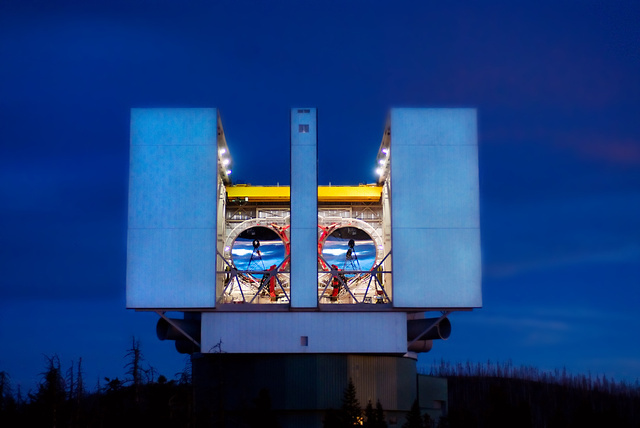 The Large Binocular Telescope (LBT) with its two 8.4 meter mirrors located at the Mt Graham International Observatory in Arizona, USA. “Discovery of this ultraluminous quasar presents a major puzzle to the theory of black hole growth at early universe. How can supermassive black holes grow so quickly when the universe was so young? What is the relationship between this monster black hole and its surrounding environment, including its galaxy host? This ultraluminous quasar with a 12 billion solar mass black hole provides a unique laboratory to the study of the mass assembly and galaxy formation around the most massive black hole at early universe,” added Prof. Xiaohui Fan from Steward Observatory, the University of Arizona, who is part of this team. For Christian Veillet, director of the Large Binocular Telescope Observatory (LBTO), this discovery demonstrates both the power of international collaborations and the benefit of using a variety of facilities spread throughout the world.